Hmmm, Xena, that is not really nice, you know.... To make fun of someone based on the size... 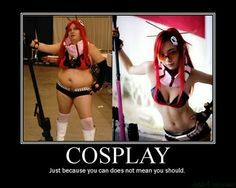 If she wants to cosplay she should. We are only talking about failed and bad costumes... Her costume is alright. There is no pink part on the gun! HA! LOL, I love them So much work and so much love has gone into this cosplay! LOL!!! This is so great! Where do you guys find this kind of stuff! ?